Gorgosaurus was a carnivore (meat-eater) that lived in North America during the late Cretaceous period, about 76 to 68 million years ago. 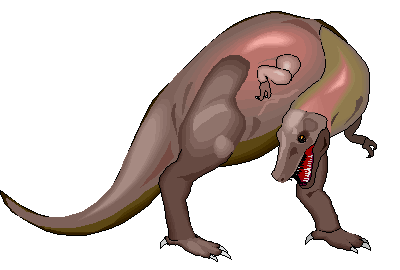 It is very similar to its close relative, Albertosaurus. Gorgosaurus was about 30 feet (9 meters) long, 9 feet (2.7 meters) tall, and probably weighed about 2.5 tons. The name Gorgosaurus means "Gorgon lizard". The word Gorgon refers to Greek myth: the Gorgons were three sisters with snakes for hair, who turned people who looked at them to stone. Gorgosaurus was first described by Lawrence Lambe in 1914. North American Dinosaurs - Gorgosaurus lived in North America. Gorgosaurus was a genus of dinosaur. "Gorgosaurus" means "fierce lizard". This name was chosen by Lawrence Lambe in 1914. Gorgosaurus was a member of the Saurischia ("lizard-hipped") order of dinosaurs. What this means, is that although Gorgosaurus was not closely related to lizards, it did have similarly shaped pelvic bones. Gorgosaurus was a Theropod - a member of a group of related bipedal dinosaurs that included the ancestors of birds (although Gorgosaurus was not itself an ancestor of birds). Gorgosaurus lived between about 76 million years ago and 68 million years ago, during the late Cretaceous period. Gorgosaurus was a carnivore (meat-eater). Gorgosaurus was about 30 feet (9 meters) long, and 9 feet (2.7 meters) tall. Gorgosaurus weighed about 2.5 tons. An imaginative story from a day in the life of a Brontosaurus. While about his daily activities Brontosaurus finds himself in trouble! An allosaurus has its eye on him and it is hungry! After a daring fight Brontosaurus manages to beat the Allosaurus with a crashing blow from his tale only to find himself in deeper trouble; a Gorgosaurus is waiting in the bushes and now emerges to claim Brontosaurus as his own lunch. Brontosaurus has to defeat yet another fearsome predator or he will literally end up as lunch meat. JURASSIC ADVENTUROUS JOURNEY - Are you concerned about your kid getting addicted to gadgets? Give them the chance to spend long play hours exploring the dinosaur world. 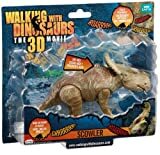 This is a complete set of 9 dinosaur action figures, as well as a compelling Dino Park mat that can hone their exploration skills. ACTIVITY PLAYMAT -Compare with competition, our rug is made of soft non-woven fabrics texture instead of thin PVC. This carpet show us an interesting cartoon dinosaur park with bright color. It is large enough for 2 to 4 players to spend the quality time together. Activity mat dimension: 31.5'' x 27.6''. NEVER GO WRONG AS A GIFT - All dinosaurs can be stored in a study carrying case with handle. It is perfect for birthday party, Christmas, holiday or impulse gift. Meantime, it can be played at home, outdoor or as part of a science project at school. The vibrant colors, the great attention to detail and the realistic moves make this dinosaur play set your #1 gift to a dino lover. Discover How You Can Spend Some Quality & Fun Time With Your Little One! Looking for an engaging and interactive toy set for your little angel? If that's the case, then we definitely have what you're looking for! 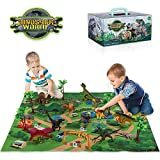 This dinosaur toys is not only a dinosaur playset for children, but also a vivid dinosaur playmat, as well as a variety of realistic dinosaurs to let your child learn and grow in the game. 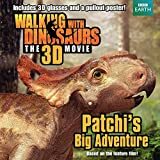 Vibrant hand-painted walking dinosaurs including glorious T-Rex, Triceratops and Velociraptor and much more make the ultimate realistic dinosaur collection to thrill any dinosaur lover. In the dinosaur park, there are 9 different dinosaurs, they walk, fight, eat, roar. Kids can dive into the world of exciting prehistoric creatures and ruled the earth! What an unforgettable Jurassic Adventurous Journey! Add to cart now and surprise your beloved son or daughter. A PERFECT GIFT ►Set of 12 novelty jurassic dinosaurs, one-time meet the needs of your kids, best gift for DINOSAUR LOVERS. Dress up your kids' desktop, bookcase or your working desk. Great choice for dinosaur party, dino decoration, collection display. Enrich your house or the office environment. 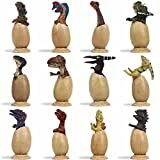 MULTIPLE FUN ►Realistic dinosaur figurine, including T-rex, triceratops, velociraptor, Brachiosaurus, etc. Educate your child to recognize them when he/she is having fun, both boys and girls love this set of dinosaurs. Suitable for the placement in any scene(you also can fix them in front of your car's windshield as an ornament if conditions permit). RISK-FREE ►The dinosaur eggs figures come with a DEFORMABLE GTFT BOX. Lifetime worry-free guarantee, On Sale for a Limited Time Only! Click the Add to Cart Button Now! Kids jurassic Party will take on a whole new meaning with the LTCtoy realistic dinosaur figures. Moms and Dads love Dinosaurs because they are educational toys! Children can recognize which dinosaurs are the carnivorous or vegetarian animal under parents help. Great dinosaur exhibit for kid's room, bookcase, writing desk, dinosaur party display, office desk...wherever you want to place. Enrich your toy collection. Each Dinosaur' surface was hand painted with natural pigments and made by eco-friendly material, it's surface is smooth without rough. We inspect them repeatedly before a sale, as we want to ensure the children using our toys is kept safe! The LTCtoy dinosaur figurines come with a GIFT BOX. Ideal for children's toy collections.Superb for kids rewards, STEM education or birthday party. 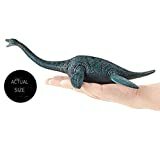 >>>>>>> Simply Click & Add to Cart Dinosaur toys on Amazon...Perfect Desktop Decoration for children's party, search "LTCtoy" to find out more different toy. Non-toxic material is 100% safe for skin and leaves no spots. Perfect to play indoors and outdoors, in water or in the bath; can be easily cleaned with a wet cloth. 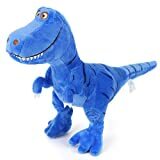 The dinosaurs toys are great as a birthday party PRESENT, Halloween and Christmas GIFTS for your kids. A variety of bright colors and realistic model can exercise child's sensitivity to the dinosaurs. It helps develop child's mind, creativity and thinking ability and train their hand-eye-coordination and hand flexibility by their own operation.Ideal for kindergarten, primary/elementary school educational projects and science classes, making parties for kids. Offer your toddlers amazing playing experience with endless fun and hours of pretend play.Kids will enjoy creating stories with detailed dinosaur figures and have a great pretend-play experience that fosters their imagination and creativity. PREMIUM MATERIAL - High-quality soft fabrics and PP cotton made. Non-toxic and odorless. - High-quality soft fabrics and PP cutton made. Non-toxic and odorless. - Comfotable hand-feeling, super-soft plush and huggable body. - Cute facial expressions and body position. Hand-wash, machine-wash or wipe off the dust with damp cloth. Small parts included. Not for children under 2 years old. Take yourself back to Prehistoric times with this realistic Triceratops stuffed animal from Wild Republic. There will be no worries about a mess with your Zoo animal plush, as it is completely surface washable. Wild Republic specializes in educational toys for kids and lifelike stuffed animals. Take a trip back in time with this realistic Triceratops stuffed animal from Wild Republic. When you see this plush toy, you will feel like you are in the middle of the prehistoric era. 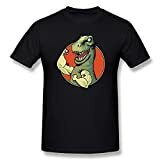 While the old dinosaurs were making messes all over, you do not have to worry about that with this plushier, as it is completely surface washable and can withstand any mess. This makes it the perfect gift for kids, teens, or any animal lover in your life. It even fits well under the tree as a Christmas gift for family and friends. You do not want to miss out on all the fun! Wild Republic has been developing plush animals and educational toys for kids of all ages since 1979, With a specialization in realistic stuffed animals.